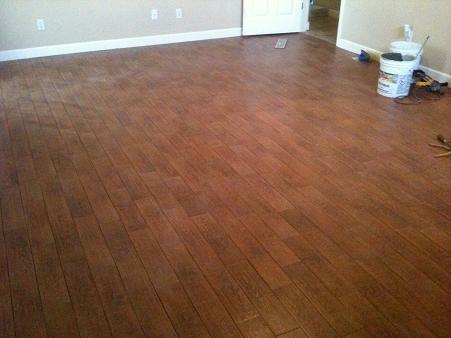 I recently did a Porcelain Plank tile floor in Wesley Chapel, Florida which is just a little North East of Tampa. 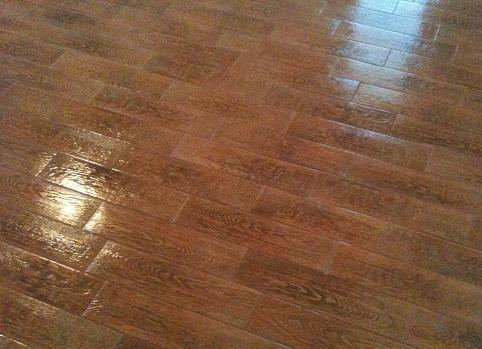 The homeowner wanted a harder floor then real wood and also didn’t want the noisy cheap floating laminate floor look and loud sound when walked on with shoes. 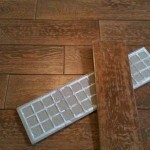 I showed them a rectified porcelain tile plank from one of my tile distributors in Tampa and they loved it. 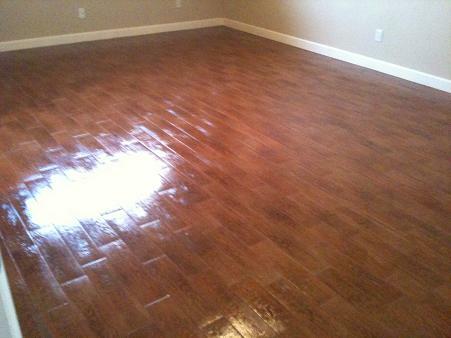 The planks were 4 1/2″ x 18″ and had a realistic wood grain pattern look to them, nice shading & coloring too. There are also a bunch of different sized porcelain plank tile from different tile manufacturers like 4″x24″, 5″x24″, 6″x18″, 6″x24″, 12″x24″ and even 4″, 6″ and 5″x36″. 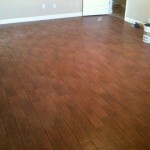 Here is a newer blog with a job we did in Tampa with 6×24 porcelain plank tile. Porcelain tile excels in the area of being resistant to all kinds of wear, acid, and everyday abrasions caused by foot traffic. 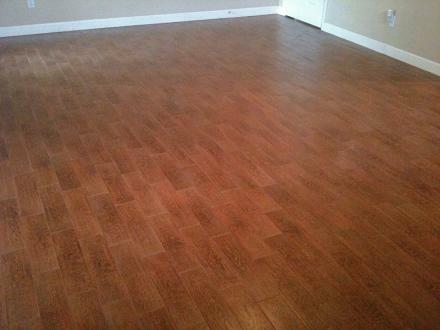 With a slip resistant surface, wood porcelain plank tile also has safety as well as beauty and longevity. 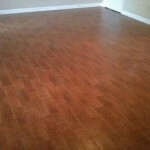 Most of the plank tile is PEI 4 rated, acid resistant, abrasion resistant, slip resistant, can have a slightly textured, matte or slightly embossed surface, tile thicknesses are from 3/8″ to 1/2″ and is a Green Building Material. Each porcelain plank manufacturer has a different look and style and plank tile can be installed in different sized rows to achieve a realistic vintage wood look. 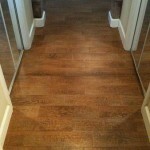 This makes porcelain plank tile flooring an excellent design choice for homeowners wanting a warm, rustic wood look with durability and beauty. 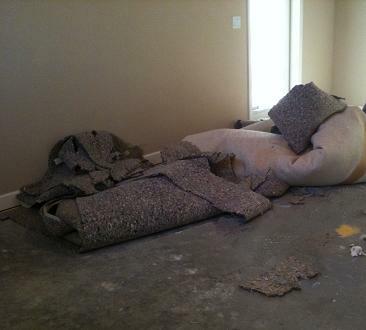 Once we delivered the tile to the job we started ripping up the carpet and tack strip. 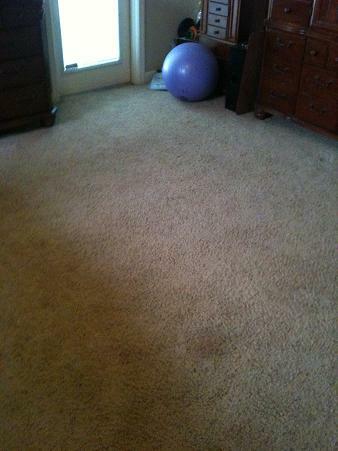 The homeowner had already moved all furniture out of that room prior to us getting there. After prepping the floor and applying a liquid crack membrane over some small cracks we measured the room and did our layout. With these types of porcelain plank tile you need to make sure you don’t have a repetitive pattern so close attention should be paid when starting each row. 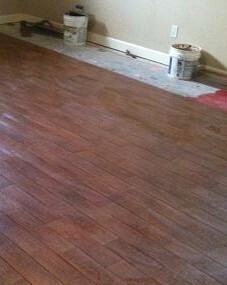 On this project we used Laticrete 252 Silver modified gray thinset to set the porcelain planks. 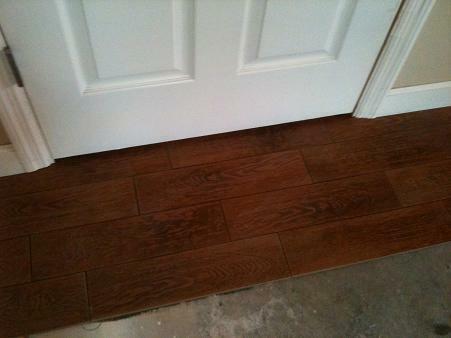 We went around prior and undercut the door jambs and made sure the tile slid under to wood baseboard. 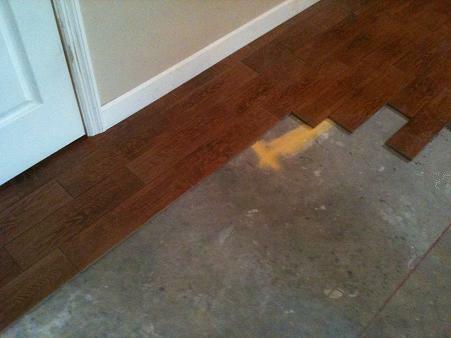 This would allow a perimeter moment joint that is not grouted and would stop possible later tenting. The concrete substrate was nice and flat which helped. We used a chalk line and snapped all of our control lines and started setting plank tile with intermittent sized tile at each row. 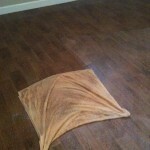 Once we set the entire floor it dried for the time required by the thinset manufacturer which is usually 24hrs. 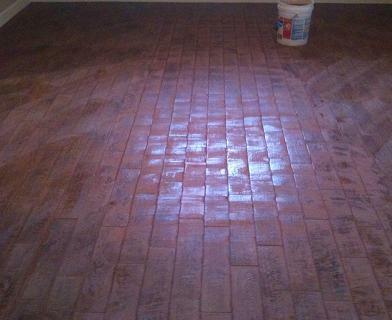 We then washed any thinset or job dust on the tile and cleaned any thinset in the grout joints prior to grouting. 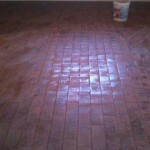 On this job we used Laticrete PermaColor #43 Chocolate Truffle sanded grout since it offers the maximum performance available in a cement-based grout, provides a consistent color and has Microban to resist stain causing mold and mildew. 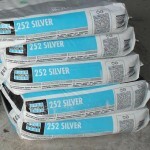 This grout is also ideal for floors and walls with grout joint widths of 1/16″ to 1/2″. 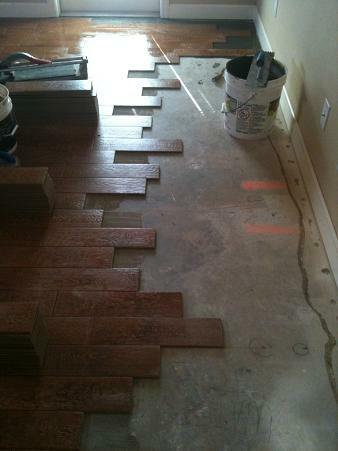 The grout joints we had installed were an 1/8″ due to the sides of the plank tile that had 1/8″ lugs that helped with the spacing on the side of the plank. After we washed and cleaned the grout from the tile with a sponge we let the grout do it’s initial set which is when it firms up. We then did a towel drag of the full floor with clean water to remove any grout dust residual and also stops an ugly grout haze from showing when dried. 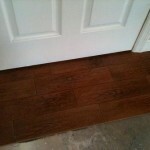 what color was use in the wood look a-like tile? 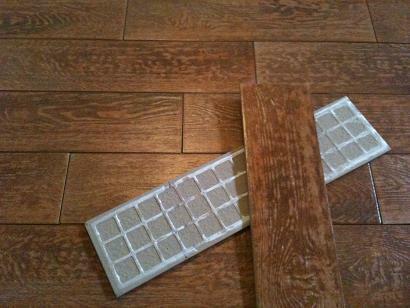 you named the grout color and the thin set you used but not the color of the wood look a-like tile. 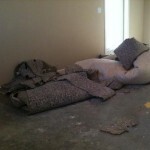 Great blog except for one huge thing: this is Florida and in Florida we have a huge problem with termites. 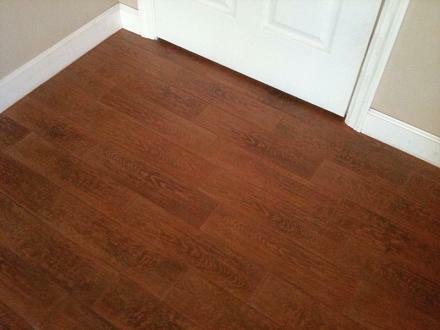 Yea, this may be tile and not wood but it looks just like wood. If I can’t tell that these are tiles how is a stupid bug going to know? Thank you sooo much for posting this!!! 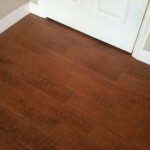 I’m considering using wood grain ceramic tile, and this has helped a lot, especially the pics! anytime Suzanne. good luck with your project and if you need any help feel free to ask on here. 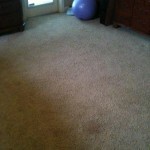 Do you have a showroom in Tampa area? 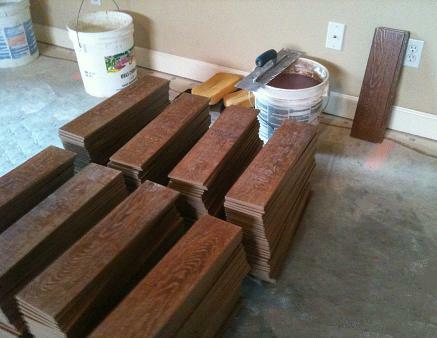 I am considering putting the wood look in my home about 75 miles north of Tampa. I need around 1,000 sq. ft. I just contacted you from the email you provided. 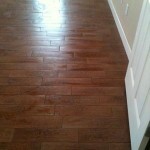 We can show you several style of porcelain plank “wood look” tile. or you can visit a few of the showrooms we use in Tampa. 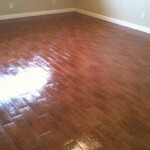 I am considering installing a wood grain tile floor. 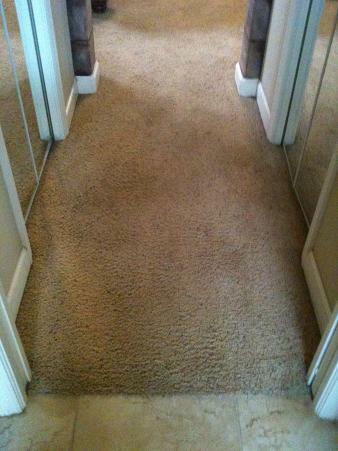 I viewed a friends floor and noticed some white showing along the edge of some tiles. 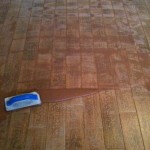 Is this normal for wood grain tiles. 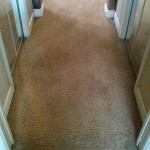 I mentioned it to the homeowner and she stated there is a stain that can be applied to the edges. 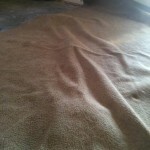 Are you aware of this issue. 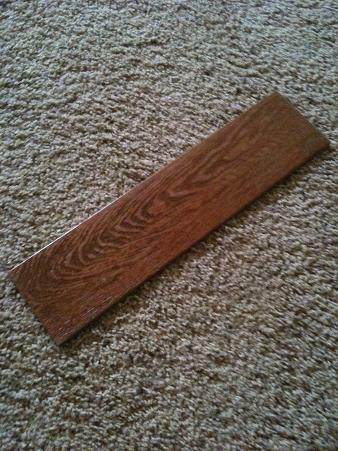 I have seen it on a some plank tile so far. Mostly it’s from the manufacturers glazing process not having the surface color continue over the edges. 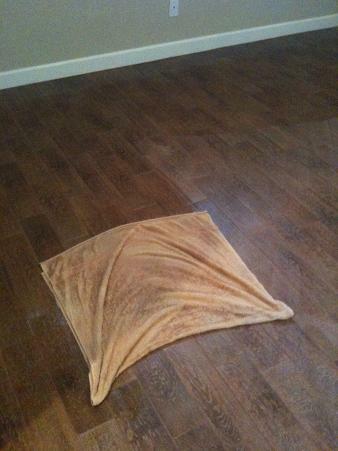 I don’t know what this other person is talking about with a stain since you can’t stain a glazed porcelain tile. I would look for a better quality tile with a better more continuous glaze. 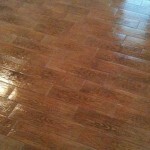 My husband has his heart set on tile, but I want hardwood floors. This might be the perfect compromise. Thanks for this website! I have 2 big dogs (1 lab!) would it be ok for their nails scratching and urine? 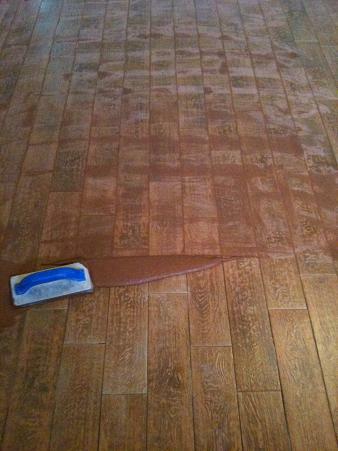 Also, did you put a sealer on? Should I with the dogs? And do you have to grout it? 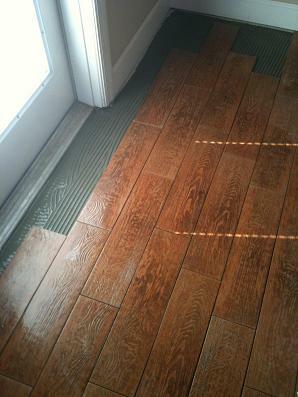 being that the joints are small the nails wont do much on the grout or tile. but urine isn’t good for cement grouts. 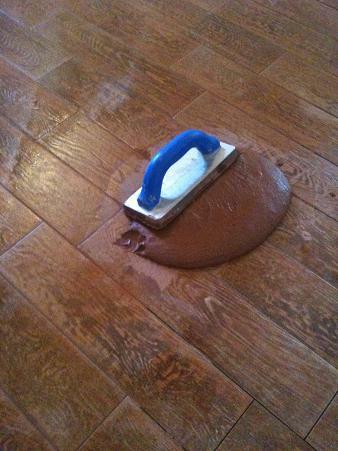 you might want to use an epoxy. I really like your layout. 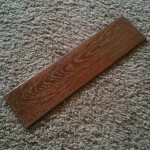 We will be using a 5×32 plank but have not decided on a pattern. Does your layout follow the maximum recommended offset of 33%? Is there any particular “pattern” or layout guide you followed or was it random? 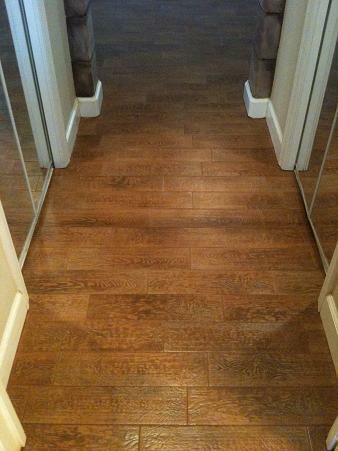 I sometimes follow that recommendation but only if the tile is slightly cupped or bowed. 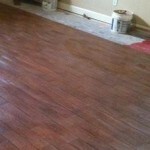 I generally tend to install plank tile now that flat and of better quality and then I can use the random pattern that I use on most of my plank tile projects in the Tampa, Florida area. 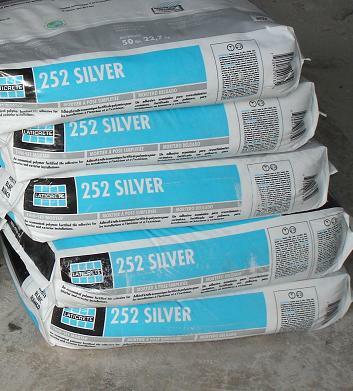 Definitely going to install this product for my home in FL. I have 2 shepherds and a lot of company coming in and out of the pool. This is exactly what we are looking for. If you work in Land O Lakes, can you please contact me to discuss pricing and your availability? I will contact you as soon as possible to talk about your project. I am replacing our downstairs bedroom with this tile, it’s 6×24. You have some nice floor patterns to keep it random. I’ve laid a 3 showers, small rooms, etc. with 12″ tiles previously. 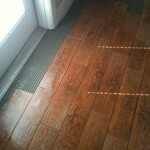 My question is: what is the spacing for the grout lines, they aren’t just butted next to each other are they? no, you never but tile together. 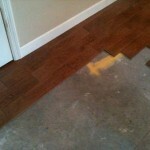 I use an 1/8″ joint with a matching grout. Thanks, I wasn’t planning on butting them together, but those grout lines look small, and 1/8″ sounds good, see ya on the other side!! 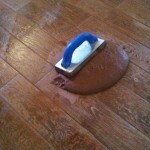 if you keep them at an 1/8″ and use a spot on matching grout it will look seamless. Have you encountered a brand of wood plank porcelain tile that comes in the following 3 widths, 4.5, 5.75, 8.625, all by 26 inches long? 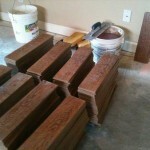 no I haven’t seen those tile sizes in plank tile. might be a Chinese brand or old style that was made before the new types of planks caught on. Thanks for this great post. 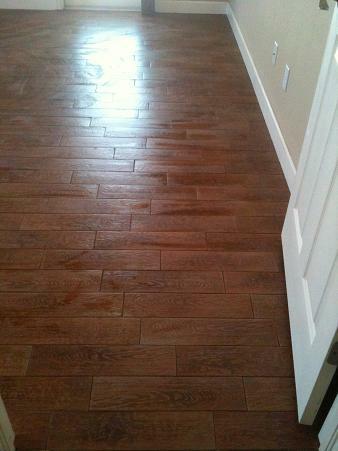 I am about to lay this type of flooring in our kitchen and was curious about the size of the grout lines and you’ve addressed that in your previous answers. Do you cover Trinity? 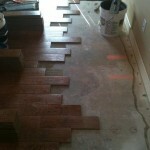 I wish to have hardwood but my husband wants tile. 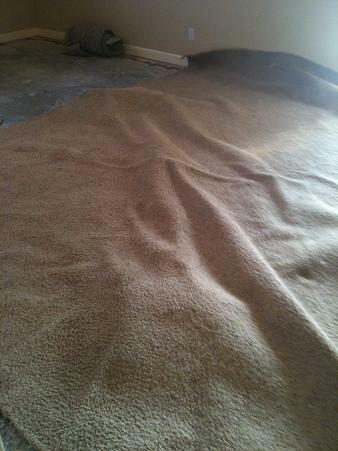 Please advise me as this fall we will remove all old builders grade tile and carpet.